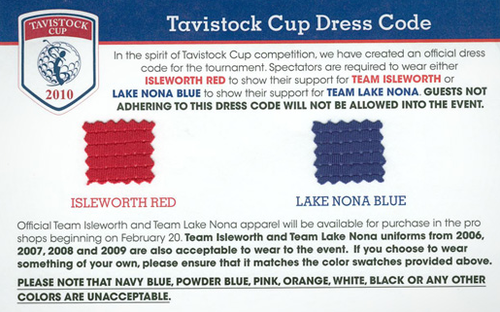 CNBC’s Darren Rovell got a hold of the invitation to the Tavistock Cup, which included a helpful insert (pictured above) explaining the dress code — one of the event’s traditions. So apparently if you’re not wearing shirts that are colored “Isleworth Red” or “Lake Nona Blue,” then you “WILL NOT BE ALLOWED INTO THE EVENT.” As you can also see, it specifically notes that a color like “Navy Blue” is not the correct shade of blue, and therefore, deemed “UNACCEPTABLE.” Members can conveniently purchase the official shirts in the pro shop (at least they can afford the overpriced uniforms). I’m all for showing team spirit, but this is taking it a little far. It seems — oh, I don’t know — cult-like. Next thing you know, Team Isleworth will be blabbering about UFOs taking them to a higher level of being.